Hello Entclass.com readers, today, i'm gonna teach you guys how to watch and read the lyrics of the music video you are streaming on youtube. Though youtube doesn't currently has this feature yet but there is an add-on that can do this on chrome and mozilla browser. Almost all of you here knows about this similar feature on TTpod for Android users, but now is for the youtube lovers. Its not that hard. How will you feel when streaming music videos on youtube via your pc and read the lyrics along. Isn't that cool? It will even make you understand the wordlings and make you learn the song faster without even bitting your tongue lol. Kindly follow my below steps, then you are good to go. You can activate this feature on the chrome web browser on your PC by simply going to musixmatch addons and add the extension to your Google Chrome Browser. After some seconds it will be included in your extensions. Now you can visit any YouTube video you want to watch and you will see the lyrics displaying automatically while the video is playing. I tested this with Beyonce's "Drunk in love" and it worked perfectly. You too can use it. Almost the same procedure with the Google chrome but in this case we will use this extension. 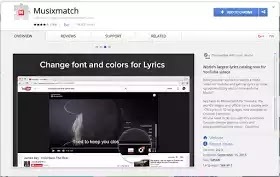 Click here to get the video lyrics extension for Mozilla Firefox for YouTube. Then click “Add to firefox”. 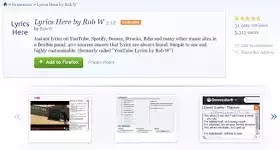 After some few seconds, the addons will install and you can now open any YouTube video and watch and see how the lyrics displays with the video that is showing.